OAKLAND, Calif. Commuters in the San Francisco Bay Area got up before dawn on Friday and endured heavy traffic on roadways, as workers for the region's largest transit system walked off the job for the second time in four months. People were lined up well before 5 a.m. Friday at a Bay Area Rapid Transit train station in Walnut Creek for one of the charter buses BART was running into San Francisco. Traffic at the San Francisco-Oakland Bay Bridge toll plaza into San Francisco and the roads leading to it also appeared heavier than normal for the early morning. Other alternatives to BART include ferries and Alameda-Contra Costa Transit District buses. CBS Station KPIX reports traffic on Bay Area freeways was crawling in the commute directions early Friday, and buses provided by BART filled up quickly. According to the California Highway Patrol, commuters who planned to drive across the transbay bridges were encouraged to pick up casual carpoolers and use HOV lanes. The two largest Bay Area Rapid Transit workers unions had said they would walk out at midnight unless management agreed to enter arbitration to resolve remaining issues. The walkout began at midnight Thursday, the culmination of six months of on-again, off-again negotiations that fell apart. BART and the unions came "extremely close" to agreement on economic, health care and pension issues, but the parties were far apart on work rule issues, said Roxanne Sanchez, president of Service Employees International Union Local 1021. The impasse came after a marathon negotiating session with the participation of federal mediators. 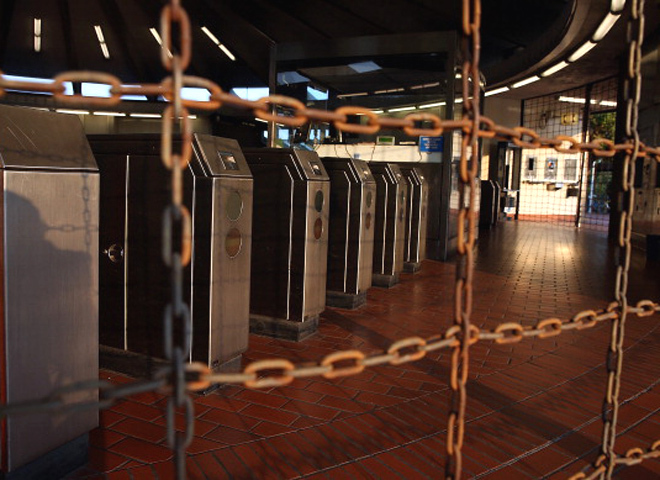 Antoinette Bryant of Amalgamated Transit Union told The Associated Press early Friday that her workers were on strike as of midnight, while Cecille Isidro of the SEIU confirmed to the San Francisco Chronicle that the unions were striking. Agency spokesman Rick Rice also confirmed the strike by the unions in an email early Friday, but he said that the trains would finish their runs early Friday so riders wouldn't be stranded. "They don't need to strike," he said. "They could instead take BART's offer to a vote of their members or continue to discuss options that could lead to a resolution." The unions said one of the work rules that BART wanted to change was employees' fixed work schedules. Some employees work four-day, 10-hour shifts while others work five-day, eight-hour shifts. Union officials said BART wanted to schedule people as they saw fit. BART officials say work rules refer to past practices that require approval from unions and management to change. The rules make it difficult to implement technological changes or add extra service on holidays because of a special event, the agency says. Sanchez said the unions suggested taking the remaining issues to arbitration but management refused. A four-day strike in July saw commuters lining up early in the morning for BART's charter buses and ferries across the bay, and enduring heavy rush-hour traffic. The San Francisco Municipal Transportation Agency said it has developed plans to help people to get around, including providing two expanded carpool locations.